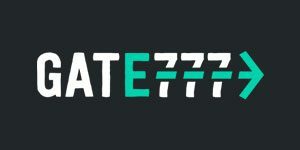 Gate777 Casino will then reward you with a bonus (Welcome Bonus is for new players only). The terms and conditions of the bonuses vary between different casinos and might also change over time and between different countries, so it is important to compare the different offers and read the T&C for Gate777 Casino before signing up. Head to Gate 777 and board what could prove to be an adventure of a lifetime. Players can check-in by filling in their details on a boarding pass and thus gain access to a first-class experience enabled by 40+ game providers. The Casino is managed by White Hat Gaming, the same company which operates Fruity Casa, 21Prive Casino and more than a dozen other reputable brands. Licenses issued by the MGA and the UKGC guarantee your journey with Gate 777 will be safe from start to finish. 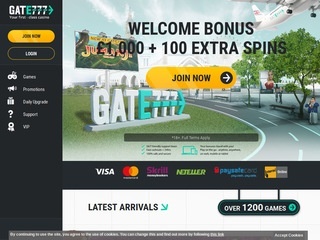 Gate 777 offers instant access to casino games from more than 40 developers. Among them you’ll see well-familiar names such as NetEnt, Microgaming, Blueprint Gaming, 2×2 Gaming, Leander, Genesis, Lighting Box and Quickspin, but also quite a few of those rarely featured on competing sites. This may be a good opportunity to familiarise with products developed by Asylum Labs, Bla Bla Studios, Concept Gaming, DTech Gaming, Fantasma, Fuga Gaming, JFTW, Pear Fiction, Wild Streak and YoloPlay. Games can be filtered by category and provider and their respective RTPs are readily available for one to review prior to making their choice. Each game icon features a “+” button which delivers basic game information and offers the player to play it with real money or fun credits. The journey is equally enjoyable when one boards using an iOS or Android mobile device. You’ll be able to carry about 700 games no matter where you choose to travel. The Casino offers players to pick among 500 classic and video slots with a variety of themes and features. The list of most popular ones includes Gonzo’s Quest, Fairytale Legends, Wild Wild West and Warlords, while staff recommends that you try Planet Of The Apes, Lucky Pharaoh, Treasure Mine and Hound Hotel. Fans of Microgaming products will be happy to find 150+ of their titles waiting to be launched with a single click. Aztar Fortunes, Dragon Lore, The Grid and Gustavo El Luchador are some of the slots from less-known providers which could easily become your new favourites. Gate 777 is also home to almost 50 titles with a progressive jackpot, many of which are currently worth over £1 million. There’s £2+ million to be collected while playing Mega Fortune and more than £8.5 million offered with world-famous Mega Moolah. Some players find slots to be too luck-dependent and prefer games that make it possible to apply one strategy or another. They’ll be offered a list of 50 different options which includes French, European, American and Double Ball Roulette, plus a good number of card games. Blackjack and Baccarat play with low and high limits while Poker fans get to choose between Casino Hold’em, Oasis, Txs Hold’em and progressive Caribbean Stud. Seven Deuce Gaming has supplied their unique Hold’em Switch and Swap The Flop. The first allows players to play or switch the hand to beat the dealer in an all-in showdown, and the other is a Texas Hold’em variant enabling one play the flop they were dealt or swap it for a new one. The Casino doesn’t feature a dedicated category for other games but does offer a range of Video Pokers. Searching by name reveals Deuces Wild, Joker Wild, All American, Aces & Eights, plus a few more game variants. Live Casino is stocked with 70+ tables powered by Evolution Gaming and more than a dozen provided by NetEnt. You’ll find a number of Live Roulette games, among which European, American, Auto, Double Ball and Lighting Roulette. Evolution delivers the usual impressive choice of Blackjack tables to enable finding one or more with appropriate minimum and maximum bets, and equally amazing selection of Baccarat games which includes Squeeze, No Commission and Dragon Tiger. The same developer boasts the most comprehensive assortment of Live Poker games consisting of Casino Hold’em, Ultimate Texas Hold’em, Three Card Poker, Caribbean Stud and Texas Hold’em Bonus. Playing for fun may be good enough for some but many of us wish to earn real cash, or at least try to. This opportunity is available to any player that funds their casino account in EUR, GBP, CAD, NZD, NOK, SEK or ZAR via Visa, MasterCard, Skrill, Neteller, Interac, Sofort, PaySafeCard or Bank Transfer. If they get lucky, the Casino will allow them to withdraw a minimum of £20 which is released following a 24-hour pending period. Maximum cash-out limits are set at £5,000 per week and £20,000 per month, though VIP players may be allowed to collect larger amounts. To start with, there is a comprehensive FAQ list which helps you instantly find answers to questions related to licenses and security, deposits and withdrawals, bonuses and technical issues. If this list fails to deliver, support team consisting of friendly and well-briefed individuals is at your disposal 24 hours a day. Players in need of assistance can contact them via Live Chat or email.